A new deal every day from Audible. Today’s deal ends 03/22/2018 @ 11:59PM PT. Richard H. Thaler has spent his career studying the radical notion that the central agents in the economy are humans – predictable, error-prone individuals. Misbehaving is his arresting, frequently hilarious account of the struggle to bring an academic discipline back down to earth—and change the way we think about economics, ourselves, and our world. Traditional economics assumes rational actors. Early in his research, Thaler realized these Spock-like automatons were nothing like real people. 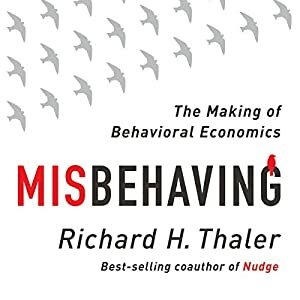 Coupling recent discoveries in human psychology with a practical understanding of incentives and market behavior, Thaler enlightens readers about how to make smarter decisions in an increasingly mystifying world.